Critically Endangered Saturium myticum only exists in the Mossel Bay area and has been found nowhere else in the world. Gondwana Game Reserve holds approximatley 80% of the population in a protected environment. The GCF together with Gondwana Game Reserve are currently running a long-term research program that will uncover the ecological secrets of the Critically Endangered orchid recently identified on the reserve by Raquel de Castro Maia. On the 13th September 2017, the first plant (Satyrium muticum) was found by Raquel, our resident fynbos enthusiast, photographer and Creative Brand Manager, while on a fynbos scout. Raquel has worked closely with the guides on Gondwana Game Reserve to identify different species that they come across during their safaris. In August this year Pat Hearfield, one of our experienced Guides mentioned to Raquel that he had found an interesting plant, but he could not identify it. Thanks to tireless searching and persistent scouting by Gondwana’s awesome team of field guides, Raquel identified the “new” plant and discovered what appears to be a healthy viable population of this exquisite rarity. There are only 3 known sites where this orchid occurs and Gondwana holds the largest and the most significant population as it is the only site formally conserved. By consulting with experts, Raquel has developed a guideline for us to collect valuable data about the habitat and bioclimatic influences that may affect the long-term successful conservation of this orchid. Gondwana Game Reserve has committed to protecting the environment within which this beauty is found. On behalf of Gondwana, Raquel has consulted with Tony de Castro and Yvette van Wyk to establish and introduced special measures to ensure minimal disturbance to the orchids habitat. 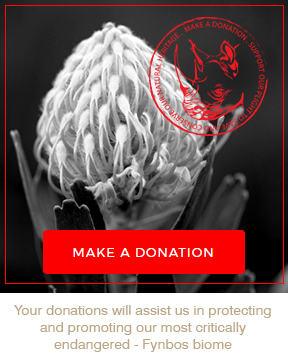 80% of the world’s population of these critically endangered plants occur on Gondwana Game Reserve, and the GCF recognises the significance of this species and the opportunity to contribute meaningfully to conserving our heritage by providing data to organisations such as the South African Biodiversity Institute (SANBI).